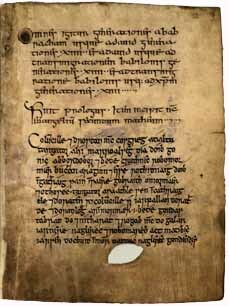 The Gaelic chapters in the manuscript are of great interest as they underline the Gaelic cultural dimensions of the N.E. of Scotland. The Book of Deer is one of Scotland’s most important manuscripts. It is a small (154mm x 107mm) Gospel Book, now housed in Cambridge University Library. Before c. 1100 it was apparently in the possession of the early Pictish monastery at Old Deer in north-east Aberdeenshire. This monastery has otherwise left no trace of its existence. A Cistercian Abbey was founded nearby in 1219. The Book of Deer came into the ownership of Cambridge University Library in 1715, when the library of the Bishop of Ely and Norwich was presented to the former by George I. Before that, the Book of Deer may have been in the possession of Dr Gale, High master of St Paul’s School (1672-97). The stages by which it moved from the North East of Scotland to the South of England are by no means clear. Even Cambridge University Library was unaware of its significance until it was discovered in 1860 by Henry Bradshaw, the librarian at that time.